A journey into the soul of American music, Take Me To The River is a live concert performance originating from the award-winning film and record of the same name, which celebrates the iconic sounds of Memphis and Mississippi Delta musicians who reimagines the utopia of racial, gender, and generational collaboration of the Memphis musical scene (represented by Stax and Hi Records) in its heyday. 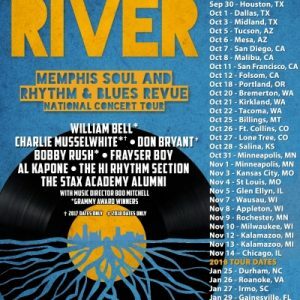 This touring concert brings an all-star lineup of Grammy-winning musicians in a once-in-a-lifetime grouping that includes William Bell, Bobby Rush, Charlie Musselwhite, Don Bryant, Al Kapone Music, Frayser Boy, the Hi Rhythm Section, and the Stax Alumni Band all under the direction of Boo Mitchell and Martin Shore. This amazing presentation will be performing at the Arlene Schnitzer Concert Hall, 1111 SW Broadway, on Wednesday, October 18, starting at 7:30 pm. Tickets can be purchased at Orsymphony.org ranging from $20.00 to $55.00.